China has offered tax rebates to manufacturers of solar power products in an attempt to prop up the struggling sector and also cut pollution levels. Manufacturers will be refunded 50% of the value added tax from 1 October 2013 to 31 December 2015, the state-owned Xinhua news agency has reported. 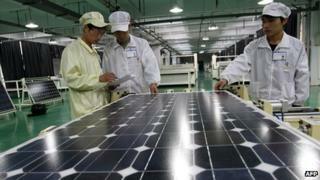 Chinese firms emerged as key players in the solar power sector in recent years. But weak demand and trade rows have resulted in overcapacity, leaving leading firms with huge debts. According to the Xinhua report, the country's top 10 solar panel makers have up to 100bn yuan ($16.3bn; £10bn) in debt. Earlier this year, China's Suntech Power Holdings, the world's biggest solar panel maker, defaulted on its debt. That was followed by a default by LDK Solar Company, the world's largest producer of solar wafers. Over the past years, economies across the world, especially developed nations, have looked to increase the use of renewable energy sources. Chinese firms have been keen to tap into the market and emerged as leading players in the sector. But a sharp decline in prices, coupled with slowing demand, has hurt global solar panel makers and Chinese firms have also borne the brunt. The US and European panel makers have blamed Chinese firms for playing a big role in that. They have accused the Chinese companies of flooding the market and of selling the panels below fair price, a practice known as "dumping". There have also been claims that China provides subsidies to its firms, which helps them keep their costs low and as a result sell goods at lower prices, resulting in tariffs from countries such as the US. China has denied these allegations. However, these disputes and falling prices have hurt Chinese firms and even fanned fears over the long term future of some of the companies. Prompted by these concerns and the rising pollution levels in the country, China has been trying to boost domestic demand for solar panels. However, the Xinhua report warned that "despite the support policies, China's bloated photovoltaic industry still faces a grim outlook". "Even if the domestic market is expanded, China's production overcapacity can not be fully digested and some manufacturers must be eliminated, analysts have pointed out, expecting the industry to see drastic eliminations and accelerated integrations in the coming months."